Village of the Damned was followed by Children of the Damned (1964) and a John Carpenter-directed remake (1995) starring Christopher Reeve and Mark Hamill that was just okay. The original, however, is a remarkable film in the sense that it had the audacity to depict children as killers, and also attack the Christian concept of a virgin giving birth – here it’s depicted as evil – something you just didn’t do 50+ years ago. A contemporary with Psycho, it has some pretty interesting set-pieces and a cool effect (for the time) with the creepy kid eyes and the fact all of them look like they could be brothers and sisters. The revamped Hammer Studios didn’t knock one out of the park for originality with Wake Wood, but they did make a creepy, atmospheric throwback with enough gore and Pet Sematary to keep us adequately chilled. The plot centers on a husband and wife (Aidan Gillen, Eva Birthistle) mourning the death of their daughter Alice (Ella Connolly) in a vicious dog attack. With their move to Wake Wood, the couple receives an opportunity to bring their daughter back from the dead for three days—a flawed plan in that once dead things get a taste for living again, they’re not keen on going back. Mayhem ensues. The original bad kid movie! Rhoda Penmark (Patty McCormack) appears to be an adorable 8-year old to her doting father, but Mom (Nancy Kelly) isn’t convinced. Bad things happen to other children whenever little Rhoda is around, and the coincidence leads the girl’s own mother to believe her daughter is a vicious killer. A creepy, atmospheric black-and-white chiller in every sense of the word, right up until the idiotic deux ex machina finale and the Leave It to Beaver closing credit sequence. (NOTE: The end credits do somewhat devalue the shock of the movie, but this was before Psycho and Village of the Damned, so we can kind of see why they tacked it on there.) Still, McCormack, who was 11 at the time, gives a jaw-dropping performance that has defined her still-active career for more than 62 years while setting the standard for murderous brats. What did Christopher Reeve have against kids? In the ’95 remake of Village of the Damned, he took on a whole class full of telepathic nut jobs, and in 1991’s made-for-cable chiller Death Dreams, he may or may not have murdered his own stepdaughter. 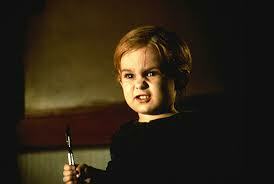 Like other creepy kid movies on this list – Wake Wood, Pet Sematary, etc. – the story focuses on a woman, whose young daughter dies tragically. With the aid of a psychiatrist, Crista (Marg Helgenberger) makes contact with her daughter and finds out that the drowning may not have been as cut-and-dry as it appeared. Director Martin Donovan relies mainly on suspense to bring the chills and also gets a lot of help from Reeve and Helgenberger. But it’s dead Jennie (Taylor Fry) that really gives us the willies. Hunt this one down if you can. Not much that needs to be said here. By now, all of you have seen it (and probably the inferior 1992 sequel). There is also allegedly a remake planned for 2013. But we’re pretty certain it’ll be hard to replace little Gage (Miko Hughes). To this day, I refuse to let a little rugrat anywhere near my Achilles tendon. Mia Farrow starred in the film many of you will excommunicate me for not including on this list, Rosemary’s Baby—(sorry, it’s good, but I only had 10 to work with). However, it’s this film that makes our hairs stand on-end. Julia (Farrow) has left her overbearing husband (Keir Dullea) following the tragic death of their daughter. She buys a new house and is quickly haunted by a presence that she believes to be her child. Well, without giving too much away, it’s a child, all right, but that’s where the similarities end. A haunting bed-wetter of a film. Little Esther (Isabelle Fuhrman) has a horrible secret, and no, it has nothing to do with the fact that she kills people and is one of the most manipulative little wretches you’ll ever meet. Orphan is essentially the film The Bad Seed could have been had it not been weighted down by the sensitivity of the day. And that ending…oh, that ending! Lina Leandersson played Eli in the 2008 version while Chloe Grace Moretz took on her equivalent in 2010’s Let Me In. The original is a masterpiece, and the remake is comparable. And while the two “little girls” are the protagonists, they have some very unsettling moments, particularly when you get them around swimming pools or urge them to enter your home without a formal invitation. The first image that comes to most of you upon hearing the words “creepy kid” is probably Linda Blair levitating and inventing new curse words for the English language in this classic shocker. 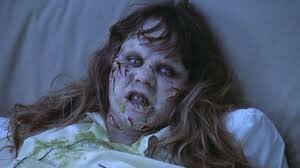 The Exorcist remains an unnerving tale of demonic possession, and what makes it especially frightening is the helplessness of the mother (Ellen Burstyn). The movie’s unsettling message is what is responsible for its lasting impact in our opinion. And that message is, you can’t protect your children from evil or becoming evil; and as hard as you try to understand them, there will always be a dark side you cannot control. 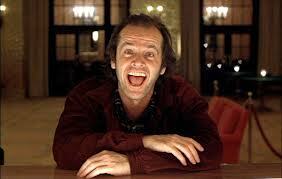 Jack Nicholson may have represented the Overlook’s menacing evil in Stanley Kubrick’s film version of the Stephen King novel, but admit it. To this day, when you hide your eyes and freak out, it’s the little girls in the hallway intercut with the disturbing flashes of horror that make The Shining stand out. As a kid, I honestly thought my bowels would loosen if I saw those creepy little girls standing there when Danny (Danny Lloyd) rode around the corridors on his tricycle. The twins (Lisa and Louise Burns) are now in their forties. Lisa attained a degree in literature and language while Louise now works as a microbiologist, according to VH1’s “Where are they Now?”. Neither made another film after The Shining, presumably to make amends for terrorizing a whole generation of kids like me.